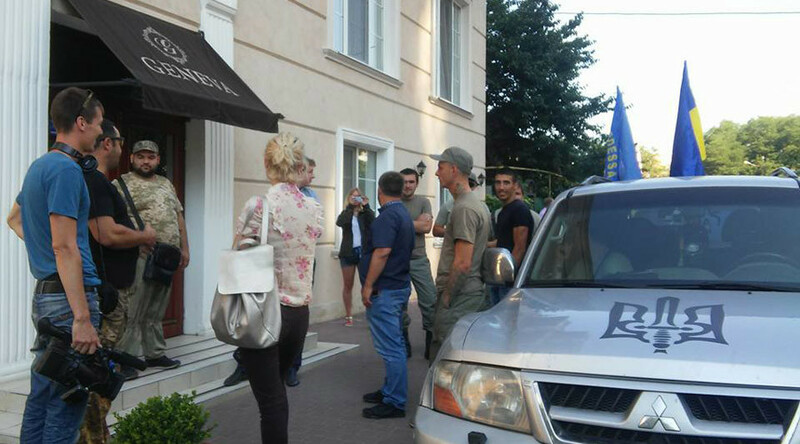 Nationalists in the Ukrainian port city of Odessa blockaded a group of Polish politicians in a local hotel for several hours, accusing the foreign delegation of being pro-Russian because they planned to commemorate the victims of the Odessa Massacre . The action was aimed at preventing the Polish politicians from laying flowers at the Kulikovo Pole Square to commemorate the victims of the Odessa Massacre. On May 2, 2014, violent clashes erupted in the city between supporters and opponents of the recent coup in Kiev, with 48 people dying in a fire set by the radicals in the local Trade Unions House building. Camouflaged men blocked the entrance to the Geneva hotel where the delegation from Poland was staying on Wednesday morning. They arrived at the scene on cars decorated by Ukrainian flags and insignias of Automaidan and other radical movements. According to local media, leader of Polish Solidarity movement, Jan Rulewski and coordinator of the monitoring mission of the Political Initiative organization, Janusz Nedzvetski, were among the members of the Polish delegation. “Janusz Nedzvetski is a member of the Zmiana party, the leader of which, Mateusz Piskorski, was one of the observers at the so-called referendum in Crimea, supports the annexation and repeats the Kremlin’s rhetoric towards Ukraine,” a representative of Obereg radical organization told 112.ua website. In March 2014, the overwhelming majority of the population of the Crimean Peninsula voted to cut ties with Ukraine and reunite with Russia. Polish consul in Odessa, Veslav Mazur, arrived near the hotel in an attempt to resolve the crisis, but was turned away by the activists. “The Polish consul came, complained about his rights being violated. It was explained to him that he’s in Ukraine and the rights of Ukrainian people are respected here. That’s how it goes,” a statement on the Automaidan Facebook page said. The Polish politicians remained trapped in the hotel for several hours before the blockade was removed at around 16:00 local time (13:00 GMT), Nedzvetski told RT on the phone. Also on Wednesday, the Odessa police said that it received an anonymous claim of a bomb planted at the Kulikovo Pole Square. A demining team with dogs was sent to the sight, but there were no reports of any explosive device being discovered. The press service of the Opposition Block party, which invited the Polish delegation, has issued Jan Rulewski’s statement on the Wednesday’s events. “We came to Odessa to understand what happened on May 2, 2014… we had a meeting plans with the relatives of the relatives of those Odessa residents, who died at the Kulikovo Pole. But or plans were scuttled by unknown people,” Rulewski said. The politician said that the Polish delegation tried to communicate with camouflaged men at the entrance to the hotel to learn their stance. “But they said that they won’t talk to us and that they don’t want us talking to the eyewitnesses of the tragedy,” he said, adding that what the behavior of the radicals was unacceptable.